An ancient Native American Ohlone village, Sitlintac, once stood on the shore of Mission Bay. Mission Creek originally flowed from a lake near Mission Dolores into Mission Bay. The houseboat community near the Giant’s ballpark floats on all that’s left of that creek. 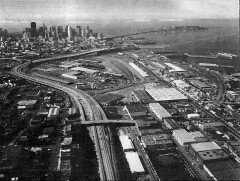 Mission Bay’s 325 acres were filled in from the 1860s to the early 1900s and it became a railroad and shipping center. Today, a brand new community is taking shape at Mission Bay. Condominium towers, parks, stores, restaurants and the biotechnology research campus of the University of California, San Francisco are here now or have started to be built. A school, more parks, and much more will be coming soon. Mission Bay is San Francisco’s newest neighborhood. 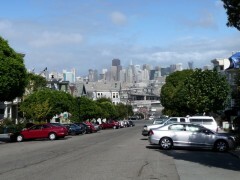 Potrero Hill was originally a virtual peninsula in San Francisco Bay, defined on the north by Mission Bay, to the east by the bay itself, and to the south by Islais Creek. These boundaries made a convenient home for Mission Dolores’ livestock in the “New Pasture”, in Spanish: “Potrero Nuevo”. The deep bay water off-shore made the Potrero an ideal spot for a port. Industries began to grow here in the 1850s until the area became a major center of California industry in the 1880s. The beautiful Union Iron Works & Bethlehem Shipyard buildings at Pier 70 tell this story. Many Irish, Russians, Scotch, Italians, and Dutch moved here to work and formed communities. Debris from the 1906 earthquake and fire completed the filling in of Mission Bay and connected Potrero Hill to the rest of San Francisco. More people moved to the hill, building homes on the hilltops as industry continued on the shore. Saint Teresa’s Church literally followed its growing congregation. In 1924, the church was cut in two, moved from Tennessee St., and pulled up the steep 20th St. viaduct by pickup trucks & ropes to its present home at 19th and Connecticut St.
During W.W.II, public housing on the hill was home to hundreds of workers. These projects on the south slopes will be rebuilt as an economically integrated community over the next dozen years. Bohemians were attracted to the hill by low rents in the 50s and 60s. Values soared with the dot-com boom of the 80s. Today, residents and visitors to Potrero Hill continue to enjoy sun, views, and a vibrant community.